Chile rayado means “striped chile” due to the naturally occurring light colored ridges. It is a member of the jalapeño family although it is much hotter than a typical jalapeño. The town of La Misión in the state of Hidalgo is the sole region where chiles rayados are grown. It is an heirloom chile variety that is artisanally produced. When the chiles are harvested, they are dried and then smoked over a wood fire for three days which gives them their unique flavor. Think of the flavor as a very intense dried chipotle. Toast the chiles in a hot pan for 10 seconds a side. Remove the seeds and stems from the chiles. Add all of the ingredients to the blender jar. Blend until just smooth. Do not over blend. Add the mixture to a saucepan. 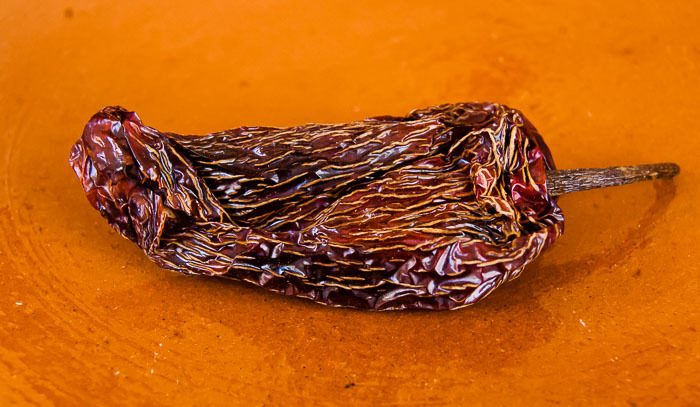 You can substitute dried chipotle chiles but you must reconstitute them in hot water. To reconstitute the chiles, soak them in a small sauce with just enough water to cover for 5 minutes. 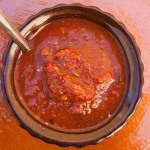 Use 1/4 cup of the soaking liquid when you blend the salsa. Where do you buy these peppers (chipoltie rayados)? I live in a small town so I have to order a lot of things online. Thank you for information.